Irish (comes with the territory as a newfie). 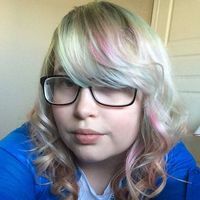 I'm a young adult female who is looking to delve into my voice acting career as well as my art, and writing career. I can do a range of voices, and do best with peppy roles. I am an excellent writer (not really), and have published a novel on Amazon Kindle. I am always writing multiple books at a time, and work a lot of the day. Recording day for me is on Saturdays, and only occasionally Tuesdays. Typically a Hobbyist, will do most work for free unless commercial.